I was lucky enough to be one of the tens of thousands of sales and marketing professionals to attend INBOUND 2018 in Boston. This was my first time at this event and let me just say - it’s enormous! With over 300 breakout sessions, inspiring keynote and spotlight speakers, including Chimamanda Ngozi Adichie, Beth Comstock and Deepak Chopra, there was plenty to do, see and learn. My takeaways were seemingly endless; here are just some of the top lessons learned at INBOUND 2018. The vast majority of people are NOT listening to your videos (unless they are at home). In fact, 85% of Facebook video is watched without the sound. Video advertising needs to be designed for the feed, not the couch. Include subtitles and important text in your videos to ensure viewers get your message, even on mute. Ignoring headlines and titles will do you no favors. Six out of 10 people admit to getting their news from reading the headlines only. As people continue to skim content to conserve energy, having a headline for them to reference should be as educational as it is catchy. If you can only choose between clickbait and informative, choose informative. 74% of budgets are spent on invasive, interruptive videos, but that closes the door to a lot of opportunities. 90% of people skip pre-roll ads (aka ads that play before your YouTube video starts) and 86% of people skip TV ads. By using video marketing in other places, such as your home page hero, your landing pages, emails and even proposals, you’re allowing people to engage with your brand in a manner they choose—which builds trust instead of causing anger and frustration. Creating marketing strategies without talking to your clients is like creating them in a vacuum. Frequently revisit your clients’ journey, both throughout the sales cycle and after they become a customer. Look for opportunities for improvement as well as your points of value. When you’re creating a content strategy, starting with buyer personas and align your content with the buyer’s journey to help optimize its performance. If you make the mistake of marketing to everyone, then you risk watering down your message and alienating your true core audience. Does everyone really need your solution? Even your mother-in-law? Even your mail carrier? Having a well-defined target market will make it easier to identify your ideal prospects, speak their language and deliver a better solution. If you try and appeal to everyone, you appeal to no one. When reviewing the performance of your published content, if you have older pieces that perhaps didn’t perform as well as you thought they would, take a look at how you can repurpose that content and try different ways to promote it to your target audience. For example, if you have a whitepaper from last year that didn’t get a lot of hits, maybe that content is too top-of-the-funnel and would be better suited as a video or an infographic. For not a lot of effort, you can use existing pieces to create entirely new ones that speak to your customers. 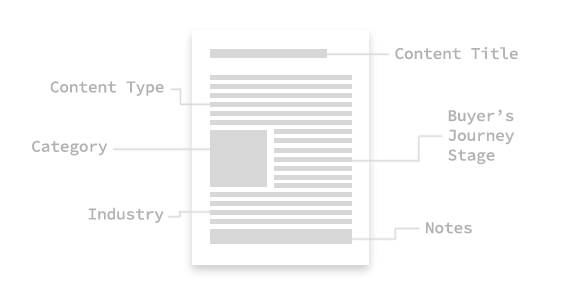 Download our free content audit template to get started reviewing and repurposing your existing content. Customers are people first, buyers second. No matter what your product is, a person is going to buy it because it will benefit them somehow. It could be that your software makes their job a little bit easier, or it makes them look good in front of their coworkers or boss. It could be because your shoes are comfortable enough to wear all day long while still looking fashionable and allowing them to maintain their personal style or status. If you focus on the needs your solution fulfills instead of just pushing the product, your customers will “get it” that much quicker. It’s critical to know what they care about so you can tell them something that will make them pay attention. We all know it’s important to tell people why our product or service is different than our competitor’s, but there are some pretty major ways we can get tripped up here. One specific example given during a breakout session was caring about your clients – if everyone in your industry can say they care about their clients then it’s not a differentiator. If you must use something like this, provide an example or a story to prove it and make it a more powerful message. Another benefits pitfall comes when we assume our client knows what our differentiators mean. It’s our duty to always answer the question, “So what?” For example, if your company has been in business for over 100 years, stating that on its own might cause clients to assume that you’re established and trustworthy… or they could assume that you’re using outdated technology and are stuck in old ways of doing things. Providing that “So what?” information gives your clients critical context. Inbound marketing is the method of attracting, engaging and delighting people by providing value at every stage and building trust and credibility. As technology shifts, how people communicate and what they expect from your business has also changed. Rather than compete for attention, an inbound approach leverages content marketing to drive traffic to your site, allowing your audience to engage with your brand as you build relationships. Email marketing and automation allows you to appeal to your audiences, delivering the right information to the right person at the right time. INBOUND 2018 was an incredible reminder of this methodology and provided countless tips and strategies to help align marketing and sales efforts and close deals faster. If you want to talk more about an inbound or content marketing approach or share your favorite INBOUND moments, talk to us today.